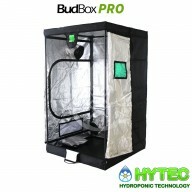 Budbox Tents - "The Best There Is !" 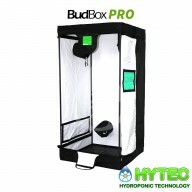 The whole BudBox Grow Tent range are equipped with steel, push & click-fit connectors, which, in addition to the thicker tempered steel poles, provide greater load bearing strength for all your filters, fans and lighting requirements. Over the past few years there have been many improvements in lighting technology and growing systems in various sizes and shapes. BudBox grow tents have a robust and tempered 16mm diameter pole in the 75 and 100 range; a 25mm diameter tempered high tensile steel pole for all units ranging from XL (1.2) up to the massive Titans. 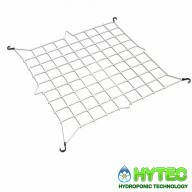 Ensuring you have all the strength that you need in the big tents to hang heavy filters and lighting rigs. BudBox inlet & exhaust ports have been upgraded to enable the use of larger fans and, if required, the use of insulated ducting. The Titan range now has 340mm vents. Each vent and cable port is double-cuffed to prevent light spill both in and out. In addition to increasing the size of the air vents, Budbox has added two extra vents in the roof and the rear wall panel (in the Titan range) which gives you the option to vent from the front and rear, enabling you to position vent fans just where you want them! 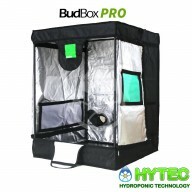 By installing ground level irrigation ports on the left and right-hand side panels of Budbox grow tents range, the designers have permitted the user to utilise either side of the grow tent to run pipe-work, both in and out of the tent. In addition to this, neat double cuffed ports solve a simple solution to a common problem. 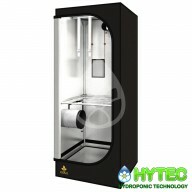 The inner skin of your BudBox grow tent is not just a simple piece of white or silver material, the success of this brand is due to its philosophy on this subject; i.e. "We Use The Best There Is! 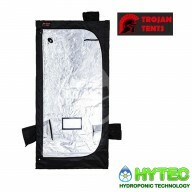 The fabric walls and watertight closures are made of a very thick canvas (between 3 and 9 times thicker than other tents). Thus, protecting your room from noise and odours. Plus, strategically placed ventilation socks are made of thick materials and have double drawstrings. 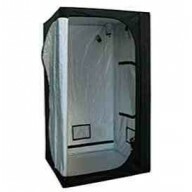 The metal structure is 2 to 5 times stronger than that of competing chambers. 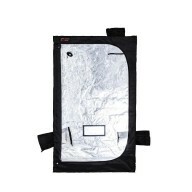 Gorilla grow tents are so strong that they can support a weight of 135 kilos; perfect for mounting Digital Ballasts, such as the maxibright daylight, utilising reflectors, such as the maxibright horizon, and installing carbon filter kits & grow room heaters. An extension kit allows you to extend the room by 30 cm. 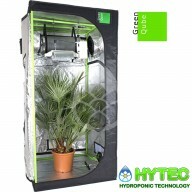 As a result, your room "grows" at the same time as your plants. 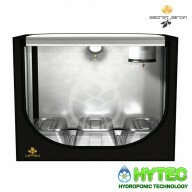 Furthermore, an included bottom tank allows cultivators to store water in case of problems of irrigation or leakage. Large control windows and 360° openings allow for convenient access to your plants from all sides. Diamond reflection technology maximises light exposure, nets preventing the intrusion of insects, and a solid bottom tray; in other words: the sense of detail is everywhere! 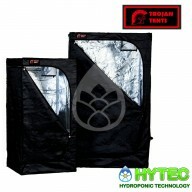 To view our range of Gorilla Grow Tents in-depth, click on the sub-categories below. 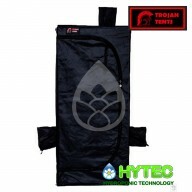 Perfectly light-tight, all tents in the Secret Jardin range feature highly reflective lining, equipped with lined and adjustable cuffs, reinforced seams and a water tray; which can be easily installed and removed very thanks to its fastening structure. 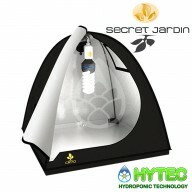 Secret Jardin tents are compatible with HPS / MH lighting as with CFL (energy saving) lamps. Make sure to check out our maxibright daylight digital ballasts and maxibright horizon reflectors to enhance the intensity of horticultural light. 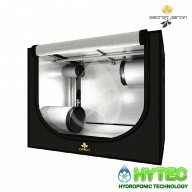 Easy to assemble and convenient to use, Secret Jardin tents are sold at the best price on our hydroponic e-shop. 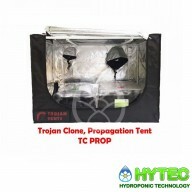 All Trojan Tents use full click together powder coated metal frame and polypropylene corners; measuring from 16mm to 25mm in diameter and 1mm thick. Sizes from 1m2 to 3m2. 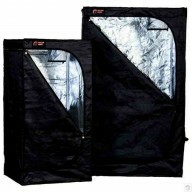 Front and side access doors allow you to gain entry to your tent from multiple sides. 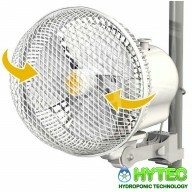 Large ventilation ports from 315mm to 355mm are designed for each specific tent and will accommodate large fans, such as revolution silence ec fans, to facilitate 0²/CO² exchange of stomata (= gain of liveliness) and expand plant structure (= production gain). Passive intake vents on the complete range. Outer fabric shell with reinforced fabric corners for improved durability and strength, large double sock ventilation ports (see specifications for sizes) and double baffled zip for enhanced light tightness. Extra large exhaust and 2 x intake ventilation ports which accept up to 12" and feature a double sock (see specifications for sizes). Cable entry ports for electrical wiring for maxibright daylight lighting kits, fans, grow room heaters and pumps. The extensive range includes various models of different sizes and for some, positioned both horizontally and vertically. Whatever your ambitions, the space you have for your plants and your budget, Green-Qube tents allow all amateur gardeners to try their hand at indoor cultivation with ease. Perfectly light-tight, all tents in the Green-Qube range feature Diamond liner with excellent reflectivity. They are also equipped with lined and adjustable cuffs, reinforced seams and a water tray; which can be easily installed and removed very thanks to its fastening structure. These eco-friendly rooms are equipped with a front door, double socks roof, back, side and ventilation, and a removable water tray. The interior lining of Green-Qube Tents are of silver reflective Mylar fabric. 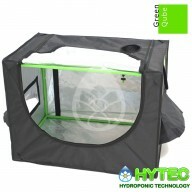 Green-Qube tents are compatible with HPS / MH lighting as with CFL (energy saving) lamps. Make sure to check out our maxibright daylight digital ballasts and maxibright horizon reflectors to enhance the intensity of horticultural light. 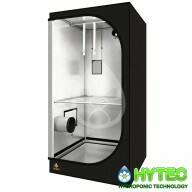 Easy to assemble and convenient to use, Green-Qube indoor grow tents are sold at the best price on our hydroponic e-shop.